Those words have never run so true than last Friday night. You know how you think about doing something, going somewhere or meeting someone? You tell people and they shake their heads and tell you why it can’t happen. But you plug away knowing that each action leads to another and another to get you closer to your goal. And there will always be those who believe. Remember this post here about Anthony Bourdain and my grassroots effort? Well, it happened. Last Friday night, I met him. I was contacted by the producer for Bourdain’s book tour and after a few posts on the fan page, they decided to bring Bourdain to Orlando as a stop on the tour. The producer was extremely cool and he offered us a pair of tickets to see the show. I went with my friend Beth since she was one of the first believers in my idea and she’s done a lot of work around town to get people on board with our Facebook campaign. Friday night came and we rode out to Hard Rock Live at Universal Studios City Walk. Beth suggested that I print out the letter I showed you in this post here. ‘You just never know’ was her last text message. Our first stop at the will call window came with a “nope, no tickets here under your name.” I sent an email to the producer to see if he could help us. 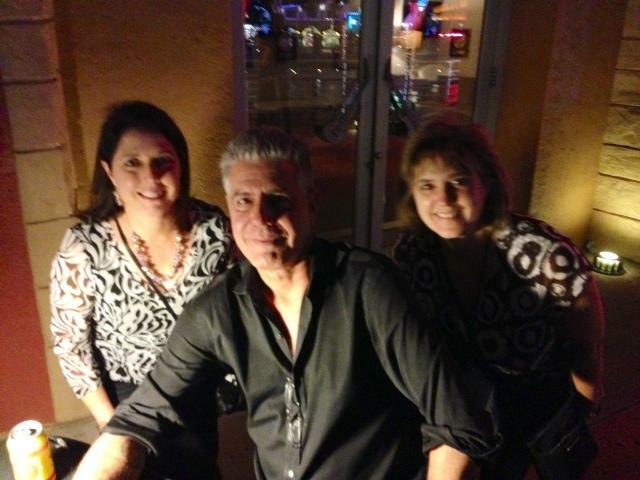 We even slipped him a note to see if he could get us into the VIP After Party so we could meet Bourdain. After several emails and a couple of calls, our tickets were released from will call but no such luck for the VIP party. As we ate our dinner, Beth looked at me and said, “It’s gonna happen Penney. We’ve done too much, come too far, met too many people for this not to happen.” I nodded my head. I wanted to believe but at that point, it wasn’t looking good. The show was the funniest live show I’ve seen in a long time. He went on for over two hours with stories, slides, videos and the insights he’s learned from traveling the world. Man, it felt good to laugh like that. You know the kind where your stomach hurts from laughing so hard. When the show ended, we watched all the people walk past us with their shiny VIP badges. Beth followed them and whispered to me, “Wait for it. Something’s gonna happen.” We watched them file upstairs into the VIP party, most of them still laughing from the show. As we stood outside the Hard Rock trying to figure out what to do next, it happened. 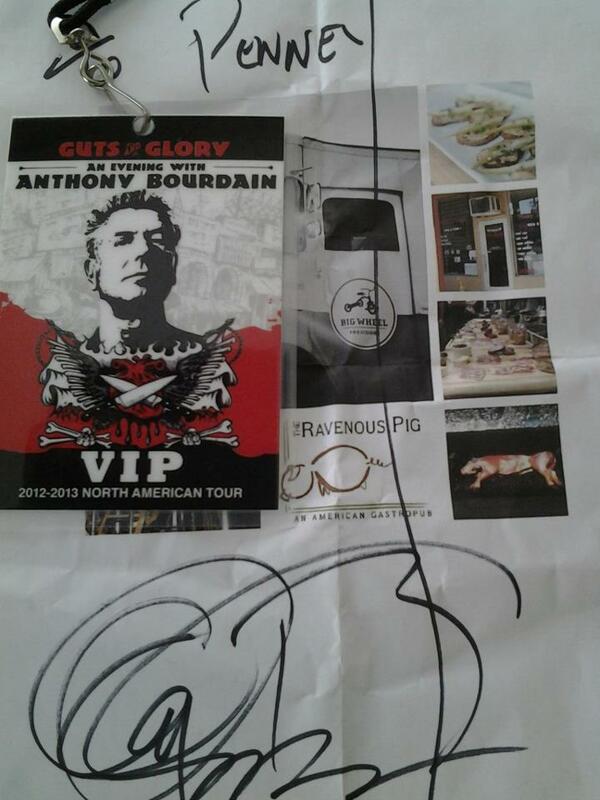 Something happened and the next thing I knew, I was standing in line to meet Mr. Bourdain. I looked over to see him sitting at the autograph table and for the first time in my life, I was starstruck. Beth and I started to practice what we were going to say. Each person had a few minutes to talk to him, take a picture and get an autograph. I was told that if I “Chris Farley-ed” him (you know that bit on SNL where Chris Farley would meet famous people and say “Remember that episode where you fell down and got drunk, that was funny”), she would smack me. Thirty minutes later, it was our turn. I was the first to reach him. He shook my hand and I froze. I stood there shaking his hand and nothing we had practiced came to my lips. I might as well have just given him some dumb grin and say “Hi, you’re puretty.” Beth gave me a shove and while she shook his hand, she started telling him about our grassroots campaign on Facebook. We have a letter, right Penney? Give him the letter. It ended as soon as it began. He read the letter quickly, made a comment about one of the restaurants, signed our stuff and took a picture. We said something about following up with his production company and he gave us some kind of nod or maybe he shook his head in disbelief about us giving him that letter. I’m still not quite sure how to read his response. I’ve been telling you guys about this thing that keeps happening to me. When you think about something, imagine it happening and believe that it’ll happen. And I mean, really really believe in it … your dreams really do happen. 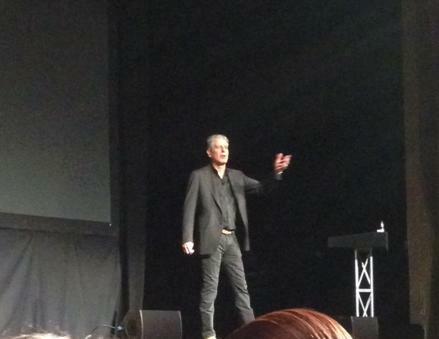 Because it’s true … where there’s a will, there’s a Bourdain. Look at you – acting like a starstruck kid. That’s cool that you got to meet your hero. Very smooth there. I am glad that your will led to the way. I know, can you believe it? He was really cool when we met him. I have no idea where we go from there but I gave him our letter to invite him here. No more production managers in the middle, we gave it directly to him. Let’s see where my will takes me next. Yeah I’m not sure what our next step is. This thing seems to be taking on a life of its own. I’m so happy for you! Glad you got your tongue tied at one end so you could speak to him. Can you believe it – I actually had trouble talking to someone. How funny is that? When have I ever had trouble talking to someone? Oh, I so remember that grass roots effort! When I saw he was going to be here, I KNEW you’d go! That is so great that you were able to meet Anthony. Good for you for giving him the letter. I am going to see him tomorrow night in Minneapolis and I can’t wait! I think this is great. I am working on making it happen with Springsteen and Stephen King. That has to be one of my most amazing moments of my life. I’ve been working on this for so long that it was hard to believe I was just standing right there in front of him, handing him my letter. I had no idea you were trying to reach Springsteen and King. You’ll have to fill me in on what you’ve been dojng. After what happened to me, VERY curious to hear your story.